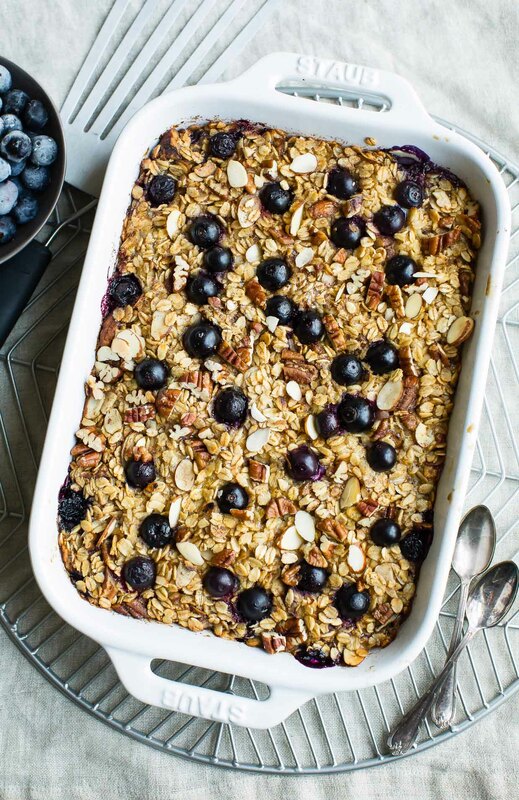 This scrumptious Blueberry Baked Oatmeal can be made using fresh or frozen blueberries. It’s naturally sweetened with maple syrup and kissed with cinnamon, giving it a french toast oatmeal vibe we can’t get enough of! 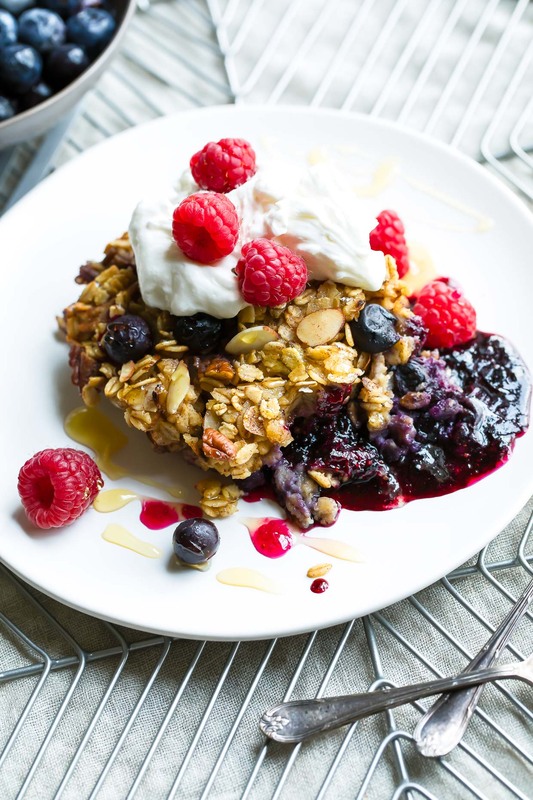 Say hello to the best baked oatmeal recipe of my life! 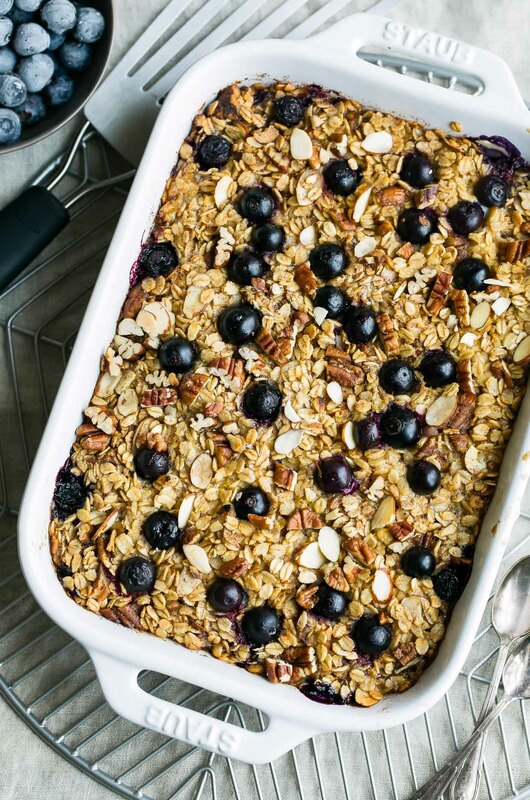 This naturally sweetened baked oatmeal is made with blueberries, almond milk, pecans and almonds, and kissed with pure maple syrup for sweetness. The cinnamon blueberry maple combo almost reminds me of blueberry French toast (after all they have a lot of similar ingredients!) and I just can’t get enough of it! Serve up this healthy oatmeal with all your favorite oatmeal mix-ins. Some may opt for a drizzle of milk or almond milk on top while others love it with a dollop of vanilla yogurt and fresh fruit. Have a sweet tooth? Sometimes I’ll go the dessert route and heat up some of the leftover oatmeal with a dollop of whipped cream and a drizzle of maple syrup on top. I also have it on good authority that it’s pretty gosh darn awesome with some vanilla frozen yogurt on top too. SWOON! 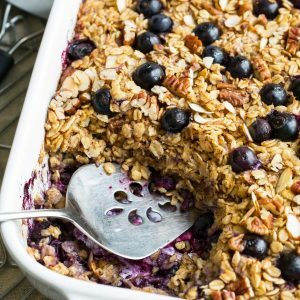 This baked blueberry oatmeal is easily made vegan by using Earth Balance or melted coconut oil in place of the butter and two flax eggs in place of the eggs. If needed, keep things gloriously gluten-free by choosing gluten-free certified oats. No blueberries? No problem! 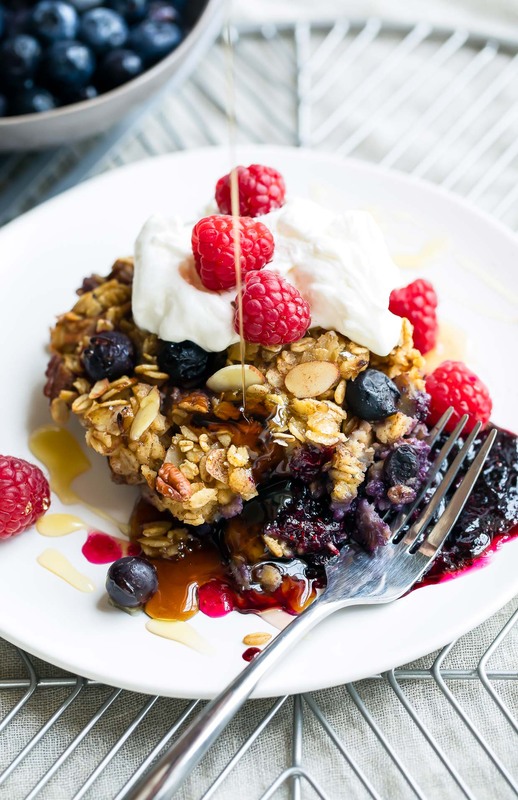 This baked oatmeal would be glorious using cinnamon spiced apples, fresh or frozen strawberries, or even a tasty strawberry banana combo of fruit. As for the nuts, walnuts, almonds, and pecans are all pretty interchangeable here (though chopped pecan and sliced almonds together is my absolute favorite!) and I think it would be entirely possible to make this baked oatmeal nut-free if needed. 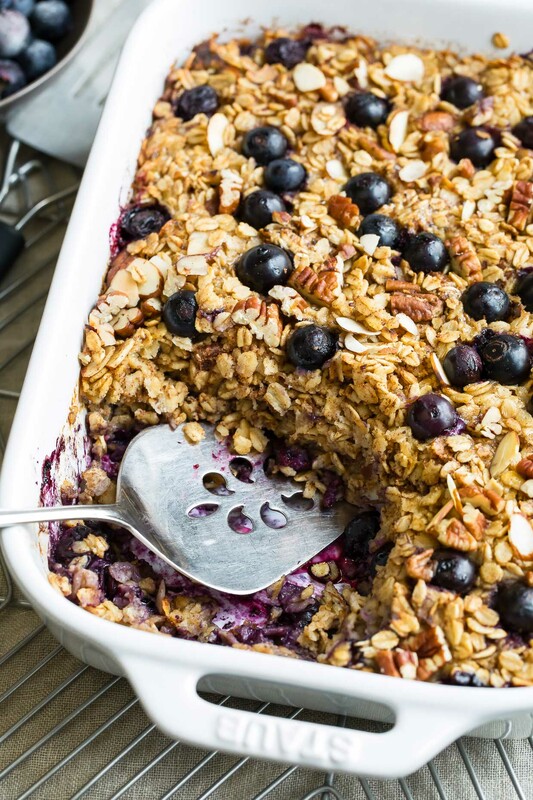 If you get a chance to try this blueberry baked oatmeal, let me know! Leave some love in the comment form below or tag your photos with @peasandcrayons on Instagram so I can happy dance over your creation. Looks very tempting, but not too sure about breakfast. Here in the UK we would class it as a dessert. This is going on the menu. Hey Erin! I’ve been meaning to try popping it in the fridge unbaked and then baking it up the next morning but haven’t had the chance to yet. I have baked the entire dish and then reheated leftovers all week long and it re-heats gloriously! Maybe that means it will work both ways? Let me know if you get to test it out tonight and I’ll for sure be testing it out this way too! When I reheat portions of the baked oatmeal it’s a little drier than that first bake, so I always add a little warmed milk after heating it up and a bit of maple syrup on top. Love it so! This is the kind of recipe that I would eat any time of day. I’m reading this way too close to lunchtime and now I totally want this for lunch!! I don’t have any blueberries in the house, so I might have to try your apple swap! Breakfast brunch and brinner FTW! Haha! 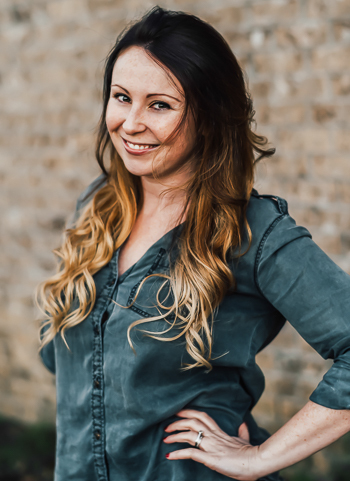 Thank you Stef – let me know what you think of the apple-fied version! This is ah-mazing! We went blueberry picking and this recipe is perfect for fresh blueberries. I am sure it is good with frozen…. we just have fresh. Thank you Sarah! Blueberry picking is one of my favorite things to do in the Summer here! Just made this and it turned out so yummy. Even my pickiest eater enjoyed it.